Author and photographer Eugene Sloan (1922-1969) was a federal court reporter for The State newspaper in Columbia, South Carolina. His photos of the Jocassee Valley are historic treasures since the area is now covered by Lake Jocassee, a reservoir created in 1973. Kathleen Lewis Sloan (1915-1997) spent her wartime years as editor of the Oliver General Hospital’s Beacon, and was later an editor for the University of South Carolina Press. Throughout his career, Eugene Sloan contributed to the The New York Times and Washington Post. His daughter Laura still has his reel tapes of Martin Luther King, Jr., addressing a Charleston audience in 1967. Though the main Sloan Collection is with the University of South Carolina, his daughter thought his Churchill photos belonged at Hillsdale, where they join an expanding archive led by the Sir Martin Gilbert Papers. 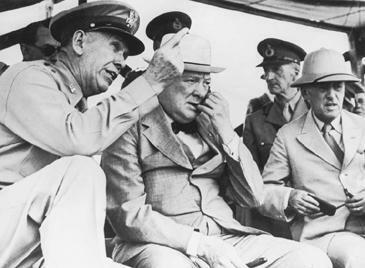 Troubled by the news from Tobruk, Churchill started for South Carolina on the evening of June 22nd, arriving at Fort Jackson the next morning. As he recalls in The Hinge of Fate, “the train drew up, not at a station, but in the open plain. 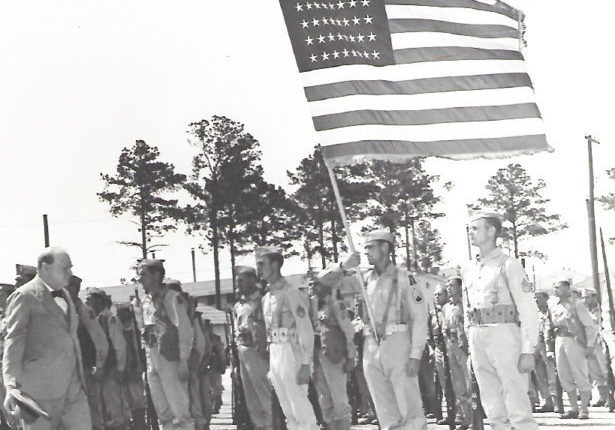 It was a very hot day, and we got out of the train straight on to the parade ground, which recalled the plains of India in the hot weather.” He stood bareheaded “as the band played the National Anthem.” Which anthem is unclear from the U.S. Army photo caption! Perhaps they played both. Will They Handle the Enemy? I greatly admired the manner in which the American Army was formed. I think it was a prodigy of organisation, of improvisation. There have been many occasions when a powerful State has wished to raise great armies, and with money and time and discipline and loyalty that can be accomplished. Nevertheless the rate at which the small American Army of only a few hundred thousand men, not long before the war, created the mighty force of millions of soldiers is a wonder in military history. I was here two or three years ago, and visited with General Marshall all Army Corps being trained in South Carolina, and we saw there the spectacle of what you may call the mass production of divisions. In great and rapid rotation they were formed, and moved on to further stages of their perfection. I saw the creation of this mighty force—this mighty Army, victorious in every theatre against the enemy in so short a time and from such a very small parent stock. This is an achievement which the soldiers of every other country will always study with admiration and with envy. We are indebted to the Sloan photographs for reminding us of two American heroes present on that day in South Carolina. Each saw service in both World Wars. 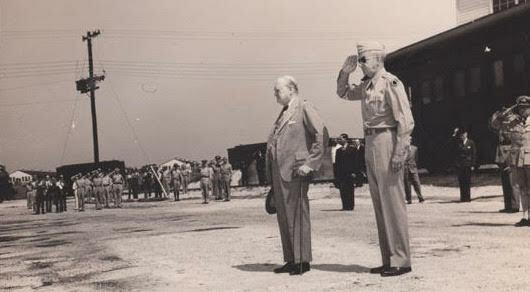 Saluting with Churchill during arrival ceremonies is General Robert Lawrence Eichelberger (1886-1961). In 1918, he won the Distinguished Service Cross for repeated acts of bravery with the American Expeditionary Force in Siberia. After commanding I Corps from June through August 1942, he was sent to the Southwest Pacific. There he commanded American and Australian troops in several decisive victories. Later, as commander of the new Eighth Army, he led the invasion of the southwest Philippines, clearing the enemy from six major Philippine islands. His final assignment, through 1948, was as part of the occupation of Japan. 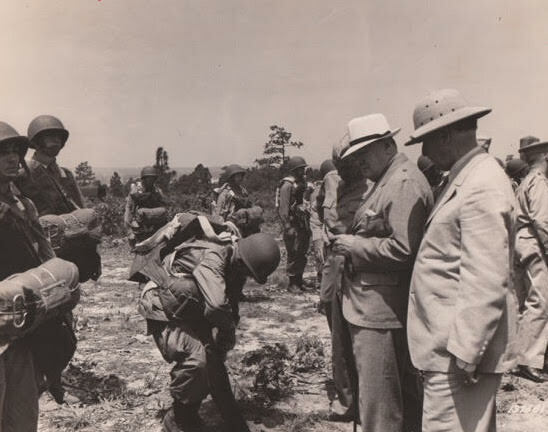 Depicted inspecting the equipment of troops with Churchill and Stimson is General William Hood Simpson (1888-1980). One of America’s most distinguished soldiers, his career dated from the Spanish-American War, to commanding the 30th Infantry Division on the Western Front in World War I, to commanding the U.S. Ninth Army during the final stages of World War II.